Note the title has = below and above. 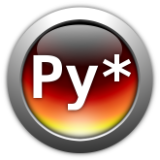 Make PyStar even better by learning to make Badges for public consumption. pip install sphinx for compiling. an editor for writing them. An example badge should have paragraphs of mostly-readable text. Question and answer sections are good! Are questions and answers good? Yes! You can also use the :answer-hidden: or :answer: classes to get this effect (which we do with jquery-ui).